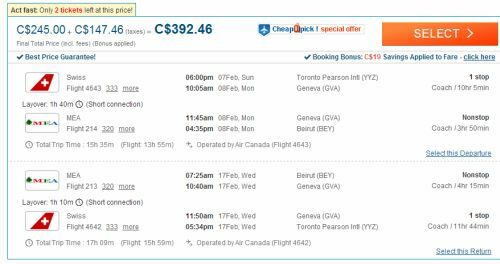 For the past few days there's been airfares floating around from Toronto to Beirut, Lebanon (BEY) for a ridiculous price of $383 CAD roundtrip including taxes. Surely this one is a mistake fare, so please don't call anyone if you want to book it. Just quietly book it online and let the airlines involved issue your ticket. Sorry for the delay in posting it up, as I've recently returned to default world after a short hiatus without Internet access, an experience which is simultaneously liberating and horrifying. 2. 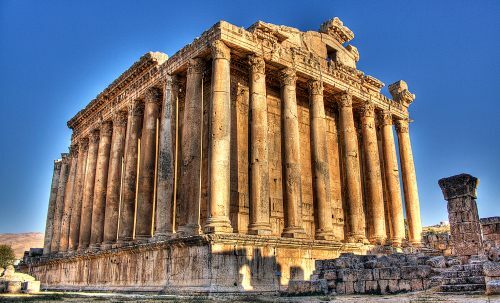 Search for a flight from Toronto (YYZ) to Beirut, Lebanon (BEY) using one of the following date combinations. Where to stay in Beirut? The following AirBNB link will lead you to some great deals on places to stay in Beirut for under $99 CAD/night for 2 people. toronto, yyz, flight deals, the middle east, swiss air, beirut, lebanon, bey and middle east airlines.